On a recent cold and rainy evening, The Georgia Ballet Company presented its seasonal showcase, a mixed bill titled Renversé, which is a French word meaning “reversed.” Clocking in at about two hours, the company noted that it wanted to “reverse and redefine” their viewers’ perspectives with seven new artistic works, ranging from classical to neoclassical to contemporary to even a child’s ballet. 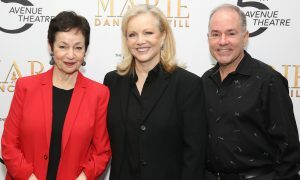 Fiona Fairrie, artistic director of The Georgia Ballet, certainly succeeded in curating a diverse program, with choreography by herself and a long list of successful and established dance professionals ranging in mood, length and topic. Plus, we were treated to guest artist Sam Chester and a guest performance by Fly On The Wall Collective. After a short and pleasant piece by Fairrie named Barre, which served as an introduction to dance for newcomers and a reminder of what dancers do to train, the production really got off the ground with Under Current by award-winning choreographer and teacher Lisa Lock, who originally hails from Switzerland. Dancers of The Georgia Ballet perform Lisa Lock’s ‘Under Current.’ Photo by Kaitlyn Pack. 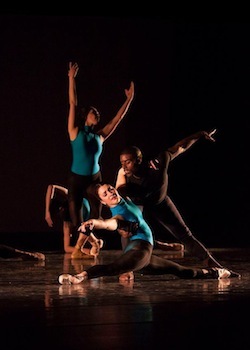 Lock created this 13-dancer work around a central couple, danced by Mark Burns (a former soloist with the Dance Theatre of Harlem) and Katie Owerbach. Burns and Owerbach each walked diagonally from separate corners of the stage in a slow-motion haze, passing dancers who moved at regular speed to eventually cross one another’s path. At this point, the other dancers faded into the wings and an intensive pas de deux began after the initial contact of a simple handclasp. While this duet was somewhat shaky, the dancers exhibited obvious trust in one another and created some gorgeous shapes. The use of large red fans in Under Current was visually stunning, and provided a satisfying sound each time they were thrown open. But at the same time, they also begged the question “Why?” They didn’t particularly seem to go with any other element of the work. Were they symbolic of something? If so, that was left entirely ambiguous. Brittany Shinay and Sam Chester in ‘Le Corsaire.’ Photo by Kaitlyn Pack. Fly on the Wall, a local project-based dance company, presented a mesmerizing contemporary dance duet dubbed fellow. This work was so intricate and demanded such attention to detail from the two performers, Nicole Johnson (a well-recognized face from her work with gloATL) and Nathan Griswald. In dark green apparel, they slid, twisted, dove, balanced and leaned into the floor, fashioning intriguing shapes and poses. Griswald opened the piece with motions that later surfaced with Johnson, opening Pandora’s box of questions on what this connection meant and what relational tensions existed. Interestingly, the movement was set to a score that combined ambient noises with more recognizable sounds, like a car going by on the interstate. This element further mystified the work, drawing the viewer further into this engrossing and abstract world. 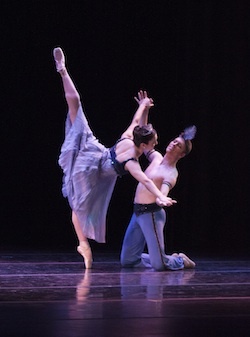 The last work in the first act was 9×5 by Rebecca Metzger-Hirsch, a former New York City Ballet dancer, a current faculty member of The School of The Georgia Ballet and the Director of Dance at The Lovett School. Her Balanchine-heavy background was evident, as this work was full of long lines and the light, airy, fast footwork typical of “Mr. B’s” choreography. Her use of ripple effects was especially pleasing. Act II brought what was certainly an audience favorite – the classical pas de deux from Le Corsaire, performed by new company member Brittany Shinay (a former Rochester City Ballet principal) and veteran dancer and international freelancer Sam Chester. Bringing all the gusto and grand showmanship these archetypal roles demand, Shinay and Chester were greeted by cheers and applause as they lept and pirouetted into center stage. Shinay was especially impressive, showing that she is a sharp and dependable technician. Brittany Shinay (center) with Mark Burns and Elizabeth Chapman in Jamey Leverett’s ‘Push and Pull.’ Photo by Kaitlyn Pack. Peter and the Wolf, a children’s ballet performed by students of The School of The Georgia Ballet, was up next, with the first real set piece and costumes of the night. 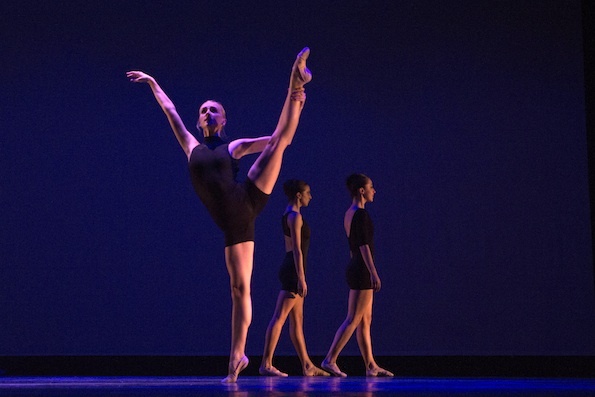 Although the students performed the choreography by Fairrie and Shinay well – with a special mention going to Erica Raver as Wolf – I couldn’t help but feel the piece was out of place in this program, dragging on too long and going too slow. Perhaps if a children’s piece is to be included, it should go in the first half of the show, when younger kids are more likely to still be awake and attentive – and adults are less likely to get restless and bored. The final work on the program, Push and Pull, was a vibrant and richly colored piece by Jamey Leverett of Rochester City Ballet. It was an excellent conclusion to the night, bringing one last burst of energy and playfulness before the curtains closed. Featuring 13 dancers in bright bluish leotards against an orange-yellow backdrop, the dancers donned pointe shoes with confidence, with gorgeous contours and silhouettes being formed as they passed through each motion. It left me wishing it was less sectionalized (the pauses made for unnecessary choppiness) and a bit longer – but in a way, this worked for the company’s benefit as it left me eager for their next production. Overall, it is clear that Fairrie has been a good fit for this company since she started in her new role. 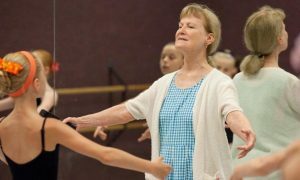 As a graduate of The Royal Ballet School and a former soloist with Germany’s Stuttgart Ballet, she brings her significant expertise to these dancers and is in turn pushing them to new heights. The dancers looked sharp and ready for their next challenge – the young and new dancers especially. I look forward to seeing what the troupe takes on next. 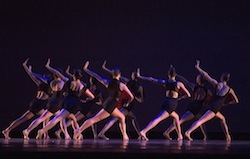 Photo (top): Dancers of The Georgia Ballet perform Lisa Lock’s Under Current. Photo by Kaitlyn Pack.